Help kick start the Watkins ES Teaching Kitchen! Watkins Elementary benefits from the FoodPrints Program, funded by the non-profit FRESHFARM Markets. 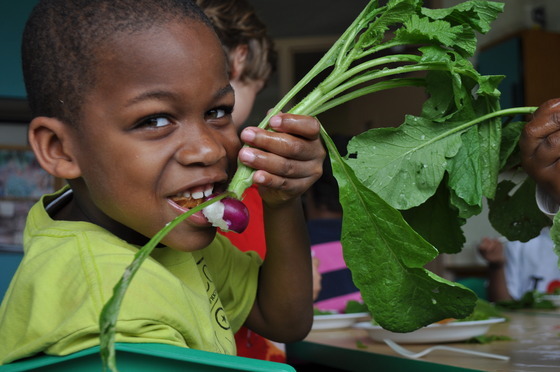 FoodPrints integrates our delicious, edible garden into weekly classroom lessons that inspire and educate our students and their families about the importance of eating fresh, simple, nutritious food. Each year, this program reaches more than 200 1st and 3rd grade students and we plan to expand to 5th grade by Fall 2011! Despite all these positives, we are still missing an integral part of our FoodPrints program and we need your help to change that. Before the school year starts in Fall 2011, we must transform our classroom space into a proper teaching kitchen. We need to raise the money now so that the kitchen construction can be done during the summer. Currently, we cook on portable hot plates, have no oven or dishwasher, and wash our fresh, garden produce in a tiny science lab sink. With your help, we believe we can raise enough money to supplement the in kind donations and labor already pledged. We need a teaching kitchen! Many people have asked us how they can help support the FoodPrints program. Two parents have already donated their architectural services to create the design plan for the kitchen. Another parent has pledged his firm’s services for demolition and disposal to prepare for the kitchen construction. Now, we need funds to build the teaching kitchen. We hope that both our parent community and the DC community at large will join our Kickstarter campaign and help turn our dreams into reality, in just a month. · large kitchen island with child height counters on one side to allow students to safely work near the cook top. Our deadline is Wednesday, June 15th. Once we achieve our goal, we can announce the news to all of our students before they leave for summer break. When they return to school in the fall, the kitchen will be fully operational! Help us turn Watkins Elementary into a place where children go home understanding that it is COOL to eat kale salad and sweet potato quesadillas–two of their favorite recipes this year! – Post the link to our Kickstarter campaign to your business and personal Facebook friends. – Email this message to friends, family, colleagues, neighbors who would support us. The more people who see our Kickstarter page, the more likely we are to meet our goal. – Embed our Kickstarter link into your signature from now until Wednesday, June 15! You guys are doing great work – Is there anything we could do to help excluding just $ donations?